Now you can have one the NFL's greatest running backs in your own home with EMMIT SMITH FOOTBALL for the Super Nintendo. Thanks to the exclusive Play Editor, you can create your very own offensive and defensive plays, resulting in a completely customized game of football. With the save feature, you'll have access to 64 unique plays at any time, which allows you to change your strategy and your approach throughout the contest. If you've seen it on TV, chances are that you'll see it in this game: long bombs, bone-crushing tackles, and amazing catches. And with the multiple camera angles and 360-degree instant replays, you'll never miss a second of the action. 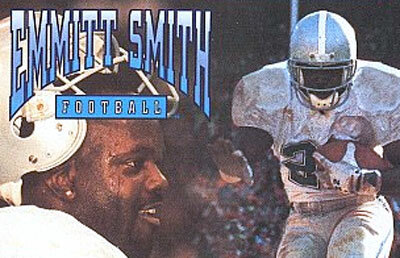 If you're in the mood for some intense, realistic football, then EMMITT SMITH FOOTBALL is just what you need.